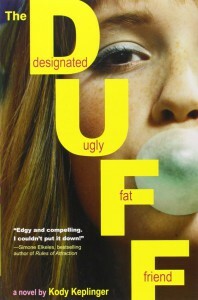 In all my years reading contemporary YA novels, I've learn that everyone has issues and that everyone is insecure, this is very true for The Duff. The Duff tackles appearance insecurities that a young girl, Bianca, has about herself. I have never heard the word Duff before, but I have heard that in every group of friends there is that one person who is prettier than the rest. The thing is (as cheesy as it sounds) everyone is beautiful in his or her own way. Beauty is all in the eye of the beholder. By the end of the novel Bianca realizes that everyone feels like they are the Duff. This novel did a great job of representing high school self-esteem and beauty. In high school the worst thing someone can call a girl is fat or ugly and to say that someone is both fat and ugly would mostly likely make them feel like crap. Bianca never thought of herself as the Duff before Wesley. It was only when Wesley called her the Duff that she began to think of herself as the Duff, which is why I hated Wesley for most of the novel. What a D-Bag. Who does he think he is? Bianca tried really hard not to care about what Wesley thinks, but even if you don't care about the person who said the hurtful statement, a hurtful statement will still be hurt no matter who says it. I don't fully understand why Bianca got into a fling with Wesley in the first place. I guess it was because she wanted to prove to him that she is not the Duff or because she's extremely skeptical of love because of her parents failing relationship, so I guess she thinks that love can't really happen, so flings are ok? Or because she just wants an escape from her home life. I hate how Bianca didn't feel comfortable talking about her issues with her friends. Her friends really care about her! As the novel progressed, I found myself not hating Wesley and then *gasp* liking him as a character! Wesley kind of grew on me. Also the more into the book I got, the nicer Wesley became to Bianca, so that helped.